Competitors T.E. Peiser and D.R. Judkins took a similar approach to these 1886 streetscapes near Second Avenue and Columbia Street. PIONEER PHOTOGRAPHS of any Seattle street other than Mill (later Yesler Way), Commercial (First Avenue South) or Front (First Avenue north of Mill Street) are rare. Here are two exceptions. Both are on Second Avenue, and both were recorded from the same prospect, within inches of one another. In the 1880s, pioneer photographers Theodore E. Peiser and David R. Judkins set up studios a block apart on the west side of Second Avenue. They were competitors and almost certainly did not plan this propinquity. 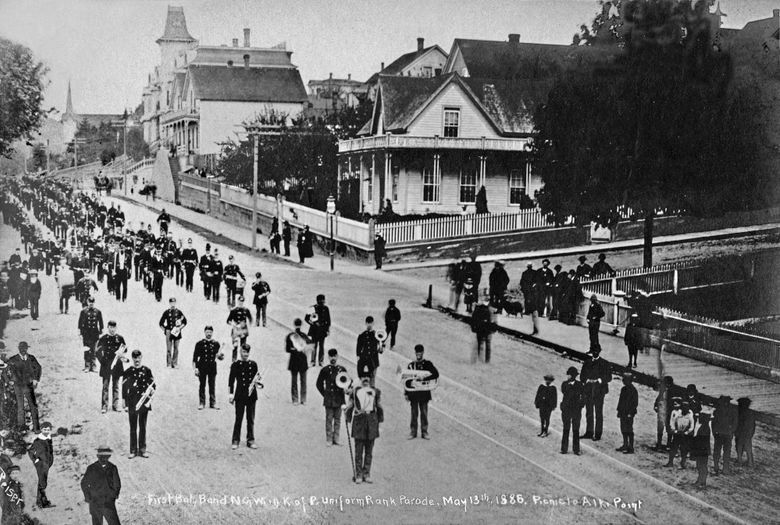 The two professionals photographed parades of different sorts near their studios, and only about six weeks apart. I am long familiar with Peiser’s May 13, 1886, record of parading members of the secret society Knights of Pythias pausing for his professional snap. As a pioneer classic, it has appeared often in publications and exhibits. We used it for its own “Now & Then” on Jan. 17, 1999. Judkins’ photo, however, I had never seen before last week. I was thrilled. Ron Edge discovered it while helping the Museum of History & Industry scan some of its oldest prints. 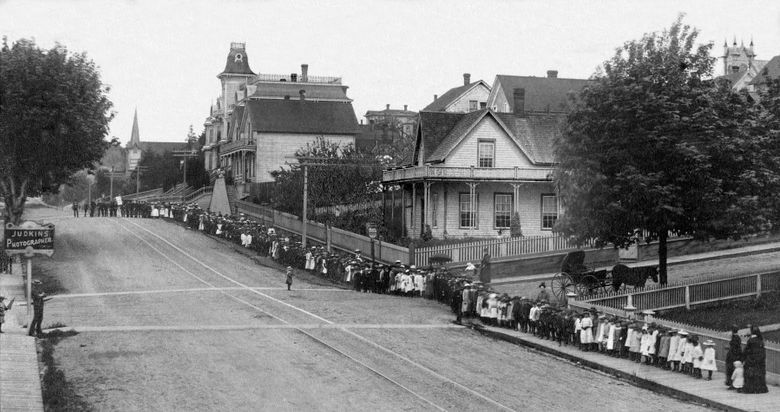 The print of Judkins’ lineup of primary schoolchildren — about 200 of them on the east side of Second Avenue, filling the block between Columbia and Marion streets, and more — is dated June 23, 1886. Handwriting on the back makes a claim for Emma Blocksom. It is her school picture, we assume, and Emma is probably one of the children posing. The Blocksoms are listed once, in the 1886 city directory, but that’s the only time. What is not explained for either of these pros is: How did they lift or carry their heavy cameras so high above the boardwalk? Here I am again thankful for help from Edge. In the MOHAI collection of older prints, he found an 1887 panoramic look from Denny Hill that includes an unobstructed sighting down Second Avenue. While it is soft on focus, it still shows many of the landmarks included here. 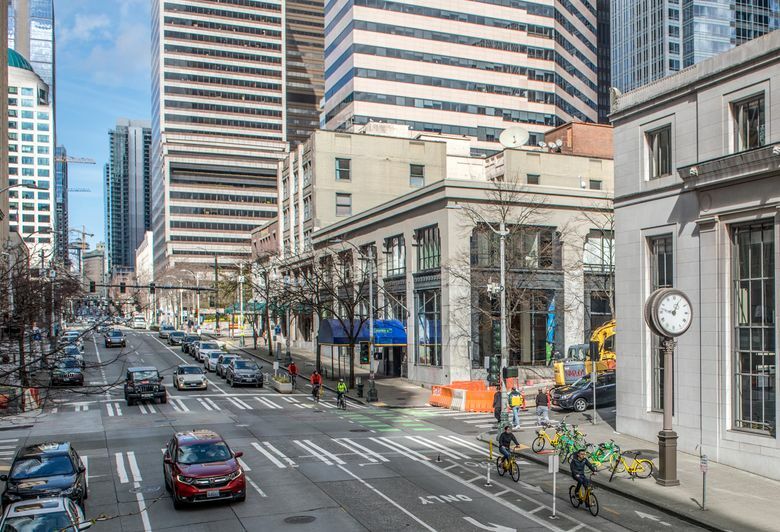 Most important, the leafy tree near the northwest corner of Second and Columbia, on the left in both of the “Then” photos, is standing in the panorama, a welcome help for our “hide-and-seek” look for the photographers’ prospect. About a third of a block south of Columbia Street, a two-story residence stands at the curb, and over the sidewalk that uniquely runs below it. The residence, we suspect, was constructed before Second Avenue was developed from a path into a street. Most likely, both photographers were invited by this neighbor to shoot their parades from the second-floor veranda.